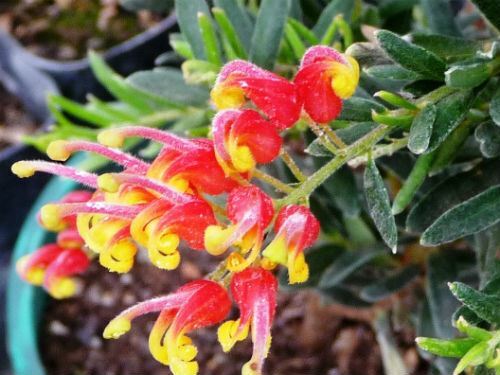 Grevillea ‘Fireworks’ is a controlled hybrid. The pollen from Grevillea alpina was applied to flowers of Grevillea ‘Pink Pixie’. The hybrid was developed by Bywong Nursery, southern NSW. This nursery has developed a huge range of native cultivars including Correas, Grevilleas and Leptospermums. Grevillea ‘Fireworks’ is a small shrub. The specimens, in our garden, reach a height of one metre with a similar spread. Foliage is soft and blue-green. Flower heads are carried on the ends of short branches. Blooms are bright red and yellow. Honeyeaters are attracted to the flowers. Plants are covered in flowers from autumn to spring. Grevillea ‘Fireworks’ is an outstanding hybrid with beautiful flowers that are carried for long periods. This hybrid could be cultivated as a colourful, low growing, informal hedge with other grevilleas such as ‘Lemon Daze’ and ‘Bonny Prince Charlie’ as substitutes for exotic box hedges.